Wrapped in both passion and elegance! Vicente Avella is a Venezuelan pianist and composer who’s scored numerous independent films, as well as orchestrated and worked on music production for major network television shows. In 2013, he released his debut solo-piano album, All the Days of My Life: The Wedding Album. 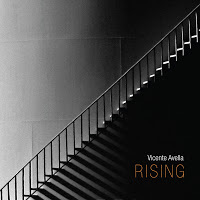 Vicente’s sophomore album, Rising, incorporates additional instruments and styles into the fold with its varying arrangements of piano, strings, guitar, percussion and electronics. Comprised of eleven songs spanning approximately fifty-seven minutes, the album beautifully showcases an overall compelling range of emotion, enthusiasm and passion. “Yours” opens with gently waltzing piano chords that are played in a repeating pattern with the left-hand and accompanied by a subtle swell of strings. Soon entering the composition is a piano melody initially comprised of single notes played with the right hand, as this combined arrangement becomes increasingly fuller with the composition overall swaying gently to and fro. Subtly brightening the mood a bit is “For Always”, a comparatively more fluid piece that boasts a repetitious stream of piano chords within a melodic ensemble of strings, as starker, sparsely-placed piano notes perfectly lend bolder accents along the way. One particular highlight is the title track, “Rising”, which showcases beautifully resonating piano chords within a mostly minor-key motif. Entering periodically throughout is a stringed percussive type of rhythm that lends the composition an infectious power, as it proceeds along in a galloping fashion that overall conveys both a sense of cinematic drama and pensive thought. The ensuing “Daybreak” is an expectedly optimistic and engagingly lively piece, which boasts a more contemporary piano melody amid a dynamically colorful string arrangement. Another notably intriguing piece is “I’m Ok”, which features a buoyant arrangement of piano and violin that’s underscored throughout by a steady, staccato drumbeat. Likewise notable is the lengthy “Looking up at the Sky”, which clocks in at nearly ten-and-a-half minutes. One of my favorites, it mesmerizingly moves along like a rushing river, eventually picking up course at about the midway point before winding down to another pause of calm towards the end. Another highlight is the aptly-titled closing piece, “Turning off the Noise”, which is perfectly understated and somewhat minimal, as drifty piano notes hover in the mid-to-higher registers amid softly suspended strings emanating from the lower range. Sure to appeal to a variety of listeners although especially those who enjoy classical-crossover styles, Rising is an impressive fusion of neoclassical and contemporary instrumental music that's wrapped in both passion and elegance!